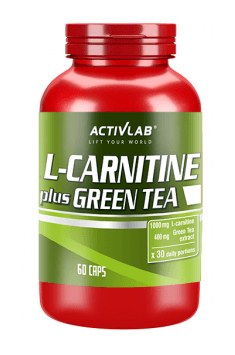 Activlab L-Carnitine Green Tea is a supplement with a combination of L-carnitine and green tea extract which supports endurance athletes and helps build lean muscle mass. It speeds up fat burning during exercise, restores hormone balance and helps remove toxic substances from the body. L-Carnitine is one of the two isomers of carnitine. Nearly 90% of carnitine in the human body is found in muscles, but it is synthesised in the liver and kidneys from the amino acids lysine and methionine in presence of B vitamins, including folic acid, vitamin C and iron. Green tea extract is an ingredient isolated from the leaves of Camelia Sinensis which contain theine, many tannins, alkaloids, polyphenols, vitamins K, P and C and B vitamins. Because of that, it has energising properties and helps speed up metabolism and promotes fat burning. It is therefore a perfect addition to L-carnitine, also when you do endurance sports and fat-burning exercises. EGCG (epigallocatechin gallate), a compound from a group of polyphenols, is one of the most important constituents of the extract. It has very strong antioxidant properties and that is why it scavenges free radicals, prevents the formation of cancer and slows down ageing processes. Furthermore, green tea stimulates the activity of some digestive enzymes and regulates hepatic metabolism. According to some studies, the extract has also the ability to completely block collagen degradation. This means that it prevents the depletion of this substance in the body, thereby helping preserve the elasticity of the skin, tendons and joints. It allows you to avoid injuries and skin damage. Caffeine is a ingredient with similar effects to theine. It has energising properties and encourages the secretion of adrenaline, dopamine and serotonin and accelerates metabolism. What is more, it promotes the relaxation of vascular smooth muscles. A large amount of L-carnitine required for normal functioning of the body is derived from food. Its highests concentrations are found in meat products: game, mutton, beef, pork and offal. Other foods rich in L-carnitine include dairy and fish. Plant-based foods contain very small amounts of the nutrient and that is why vegetarians and vegans are especially at risk of deficiency and should therefore take a supplement. The most popular function of L-carnitine in the human body is that it helps transport fats to mitchondria where they are converted into energy. It can be therefore concluded that a high intake of L-carnitine stimulates fat metabolism in the body. It is needed to maximise fat burning, but exercises are also an essential element of this process. Other studies show that L-carnitine supplementation helps combat cholesterol. It has been demonstrated that large doses of L-carnitine practically do not increase its muscle concentrations (by up to 1-2%) when it reaches its peak levels. Its excessive amounts enter the bloodstream and are consequently excreted from the body. Even though L-carnitine distribution in the body may be quite disappointing, it makes this substance safe and reduces the risk of overdose. Since L-carnitine enhances energy production from fats, maintaining its normal levels in the body is very important for individuals doing endurance sports. As a result, this helps your body switch from burning sugars to fats faster and rapidly boosts energy levels during a long workout. This contributes to preserving glycogen stores and prevents muscle damage caused by protein utilisation for energy production. Apart from stimulating fat metabolism, L-carnitine regulates levels of thyroid hormones and testosterone. Furthermore, it improves neuronal fuction, has detoxifying effects and is capable of binding metallic elements and eliminating free radicals which in excess may cause cancer. Apart from vegans, individuals with liver, renal and cardiac dysfunction are also at risk of L-carnitine deficiency. It is mainly manifested in impaired physical performance. In L-carnitine deficiency, even gentle exercise causes fatigue and even exhaustion. A progressive decline in levels of this nutrient in the body results in skeletal muscle atrophy, myocardial dysfunction, lack of energy, exercise intolerance and impaired intellectual performance. To sum up, Activlab L-Carnitine Green Tea helps get rid of excess body fat. It enhances energy production from fats and thus allows you to exercise more without increasing carbohydrate intake. It has energising properties and reduces fatigue. It has a vital function in the regulation of hormone levels and has antioxidant and detoxifying effects. Mój ulubiony spalacz i polecam go każdemy kto chce pozbyć się zbędnej tkanki tłuszczowej. L-Carnitine Green Tea 60 caps. Remember that high-temperature cooking, e.g. frying and roasting meat, destroys lysine which is used for the synthesis of L-carnitine. What is more, vitamin C deficiency may significantly impair L-carnitine synthesis in the body. It may cut its production even by half. L-Carnitine should be supplemented primarily by vegetarians and vegans, but also by those whose diet is irregular and unbalanced, leading to undernutrition. The supplement is also indicated for persons with kidney or liver diseases. Anti-caking agent E470b, acidity regulator - citric acid, coating (cellulose, E171 dye).